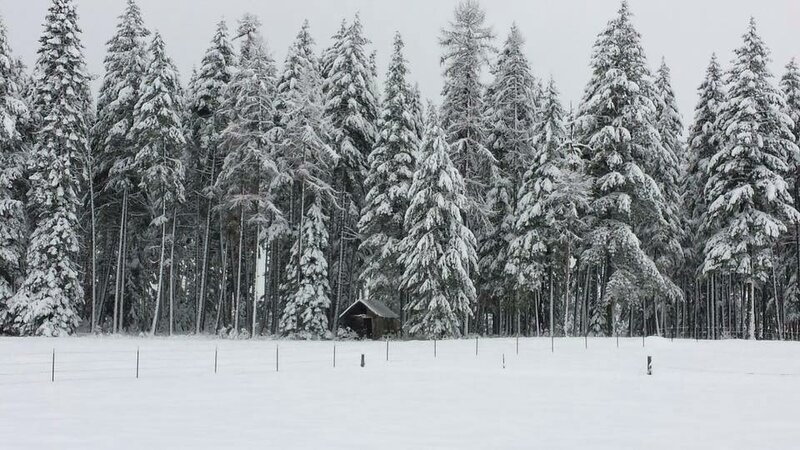 ​In the far North Woods of Idaho you'll find a cozy little homestead raising Registered Miniature and Midsize trained Jersey family milk cows. We're grain-free, GMO-free, pasture based, and strive for beyond Organic practices on our homestead. We pride ourselves on caring for our animals as well as we would our children, seeing to their health and comfort before our own. We're excited to share our little Jersey cows and rare breed chickens with you. Lance was raised next door to his grandpa's small dairy farm of mixed breed cows. He remembers the old fridge on the porch full of milk and the neighbors paying by honor system. While Lance was still serving in the Army, in the Fall of 2012, we bought two bred Jersey cows and dreamt of Spring calves and fresh Raw Milk for our family. Before Sweet Cream and Buttermilk calved, Lorinda had never milked anything. Ever. And, to really add to the steep learning curve, they hadn't been handled much and had never been milked. She learned a lot VERY quickly, mostly about being patient and observant. Both cows went on to be family milk cows and she was praised for their wonderful manners during milking. 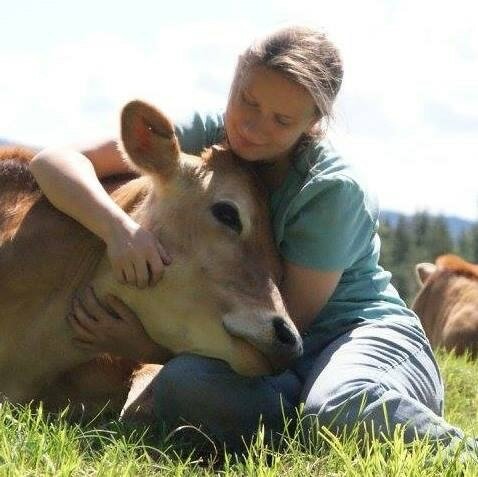 ​Despite her initial fear, and occasional tears, Lorinda was in love with her Jersey cows and our herd hasn't stopped growing since! 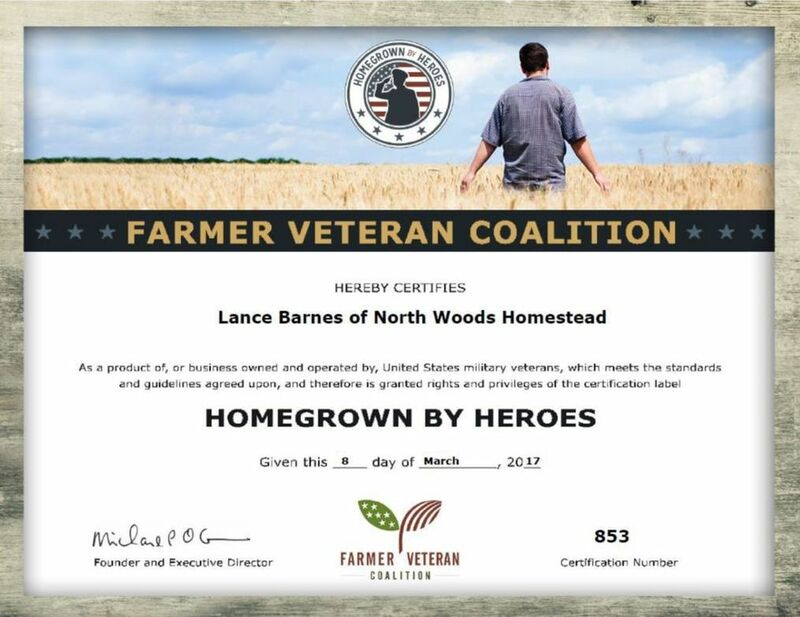 Lance grew up next door to his grandparents small farm. Part of his daily chores from an early age were to look after fences and livestock. He joined the Army as a Senior in High School. After serving 27 years, he Retired as a First Sergeant. 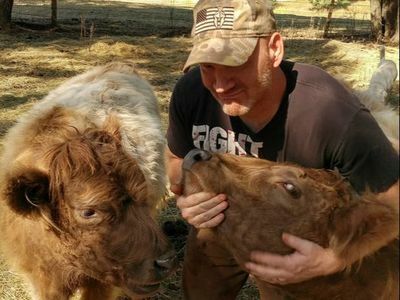 ​His favorite livestock are his Polled Mini Highland heifers and the six sweetest barn cats you'll ever meet. Lorinda has fond memories of her time exploring the woods behind their house and the ponies they owned when she was in elementary school. She dedicated her life to her children and homeschooled them both from an early age through High School. She's obsessed with her Mini Jersey cows. Recently, she's made room in her heart for Faverolles chickens. Amber spent her early years as an Army Brat, traveling the USA from Washington State to Alaska, New Jersey, Georgia, and Kansas. She eagerly joined her parents in Idaho and lives on the family farm. She loves all the animals and takes most of the photographs featured on the website and Facebook pages. If pressed to choose a favorite she'll say the Livestock Guardian Dogs. North Woods Homestead closed the herd with the arrival of the last purchased cow, Kloppe Formidable Bella, Aug of 2017. There has never been a positive disease test on any of their cattle. ​Several diseases, Bovine Leukosis Virus, Bovine Viral Diarrhea and Johne's Disease are rampant in the US among beef and dairy herds. It's estimated that 84% of dairy herds in the United States are infected with BLV. Sub-clinically infected animals shed the virus in milk, blood, saliva, and nasal secretions. Research is being conducted currently on BLV replication found in some humans. Johne's has been detected in humans with Crohn's disease, though if there's a connection it's unclear. Ranchers and farmers experience economic losses from reduced production and deaths related to these diseases and BVD. Due to the highly contagious nature of these diseases testing and a minimum 30 day quarantine of new animals prior to joining the herd is strongly recommended. North Woods Homestead maintains a closed herd. No new cattle are being added to limit the risk of disease introduction to the clean herd. The purpose of the National Poultry Improvement Plan (NPIP) is to ensure the health of avian flocks. The NPIP is a state and federal program that was established with the intent of eliminating Pullorum disease. The program now includes the testing and monitoring of Salmonella typhoid, Salmonella enteritidis, Mycoplasma gallisepticum, Mycoplasma synoviae, Mycoplasma meleagridis and Avian Influenza. Commercial poultry production, backyard breeders, show birds, domesticated waterfowl and game birds are included. Nationwide sales and interstate transport of adult birds, chicks and hatching eggs requires NPIP certification. ​Shipments are documented with a VS Form 9-3. Annual Pullorum Typhoid (PT) testing completed for purposes of the NPIP program also fulfills poultry show and county/state fairs exhibition requirements. The standardized certification is recognized nationwide. 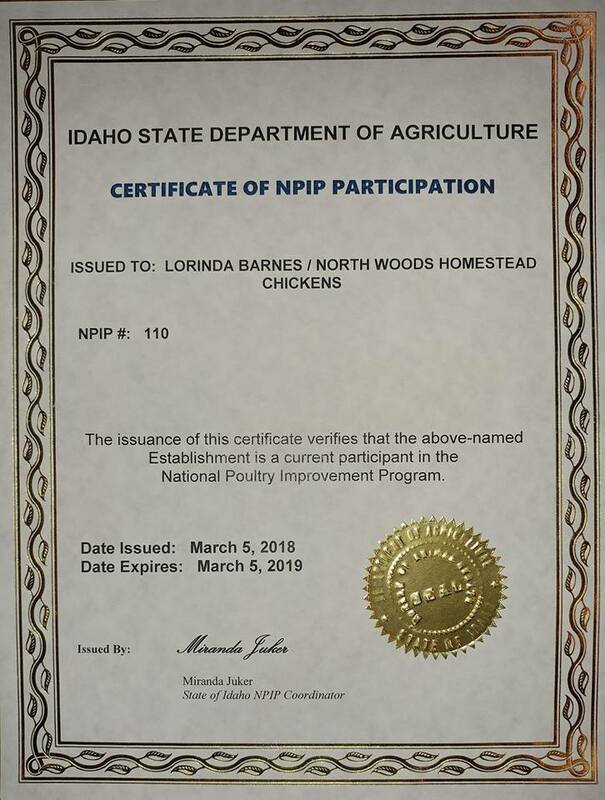 The North Woods Homestead flock of rare Salmon Faverolles is recognized as a participating member of the NPIP, #110. Participants can also have their flock tested for H5/H7 Avian Influenza (AI). This testing is completed by an ISDA field representative. The flock at North Woods Homestead is tested for Avian Influenza and “AI Clean”. The National NPIP website lists all hatcheries, dealers, and independent flocks in the United States for those who wish to purchase poultry from an NPIP source. The American Poultry Association is the authority on breed Standard characteristics. They promote and protect standard bred poultry at all levels and publish ​the book, American Standard of Perfection, with the breed and variety descriptions for all the recognized purebred fowl. They assist, encourage, support, and sanction poultry shows all over the USA and Canada as a means of sharing purebred poultry with the public and interest future breeders. The Association licenses poultry show Judges. North Woods Homestead, LLC, believes in and supports the efforts of the APA as Members in good standing. Our Salmon Faverolles are being bred to the APA Standard of Perfection. An APA Hall of Fame Exhibitor, Judge, and Breeder helped us cull our foundation stock and was hands-on in the selection of our breeding flock. ​Our herd has tested 100 percent genetically pure, Breed Based Representation, BBR 100. Two Midsize cows, NW Emerald and NW Ruby, and Midsize heifer, NW Snowflake Flurry, have tested as 100 percent pure when their DNA was compared to a database of known purebred Jerseys using the 9K Ultra Low Density chip. The 45K chip was used for heifers NW Fern, NW Joe Brook Shoun, and Kloppe Formidable, and cow Goodsell Andy Betsy. 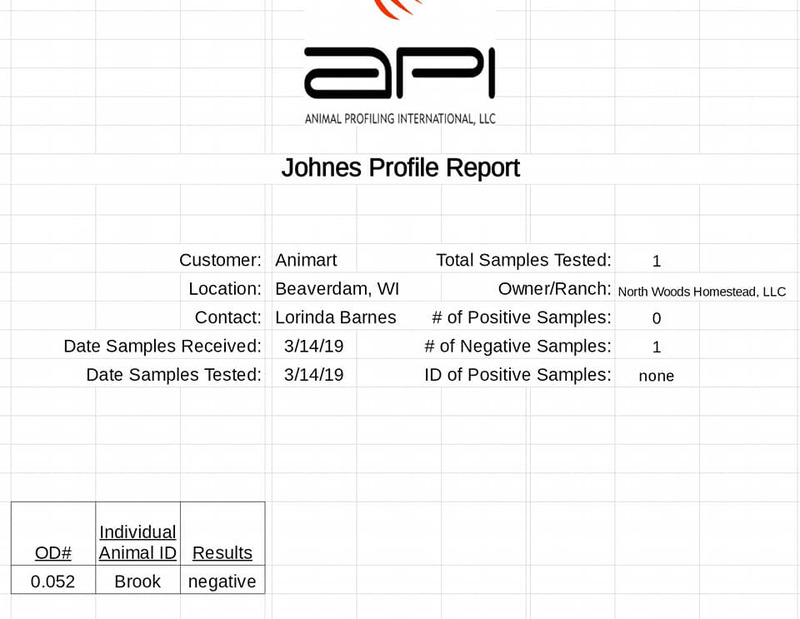 The American Jersey Cattle Association offers genotyping through GeneSeek to recover genetics of unregistered Jerseys back into the Registry. Our herd are Registered with the AJCA, five of them meeting the recovery program requirements. Our two original bred Jerseys, Sweet Cream and Buttermilk, were known to be pure but unregistered by their breeder. Sweet Cream is the Dam of Buttermilk. Buttermilk is the Dam of Emerald and Grand Dam to Ruby. Emerald, Ruby, and Snowflake were sired by Toro, an unregistered purebred Jersey bull sired by Eclipse - P (JEUSA114845461 BBR 100) and purchased as a calf from the Frye Dairy in Wamego, KS. We knew we had good dairy genetics behind the foundation of our Mini Jersey herd but wanted the proof for our clientele. The 9K Ultra Low Density chip includes breed specific SNPs for JH1. The reliability of genomic evaluations using the uLD chip genotypes are nearly the same as the LD chip if both parents are genotyped. Otherwise, the reliability may be 2% lower compared to the LD Chip Haplotypes for JH2. All results of 94% purity or greater are reported as 100% pure. We chose Salmon Faverolles off the The Livestock Conservancy Conservation Priority List for their docile nature, hardiness, great Winter production of tinted eggs, and early maturity. An efficient dual purpose breed appeals to us as homesteaders. The Faverolles will be bred to strict American Poultry Association standards to provide our community with quality chickens. We will be offering hatching eggs, chicks, and Pullets by Spring 2018. We gained membership to The Livestock Conservancy to help with the efforts to save this rare breed of unique colored five-toed chickens from extinction. There are many other species being endangered and we look forward to adding more uncommon heritage animals to the homestead. We work hard to maintain biosecurity and are getting better at it all the time. As part of our measures we "spot test" annually. 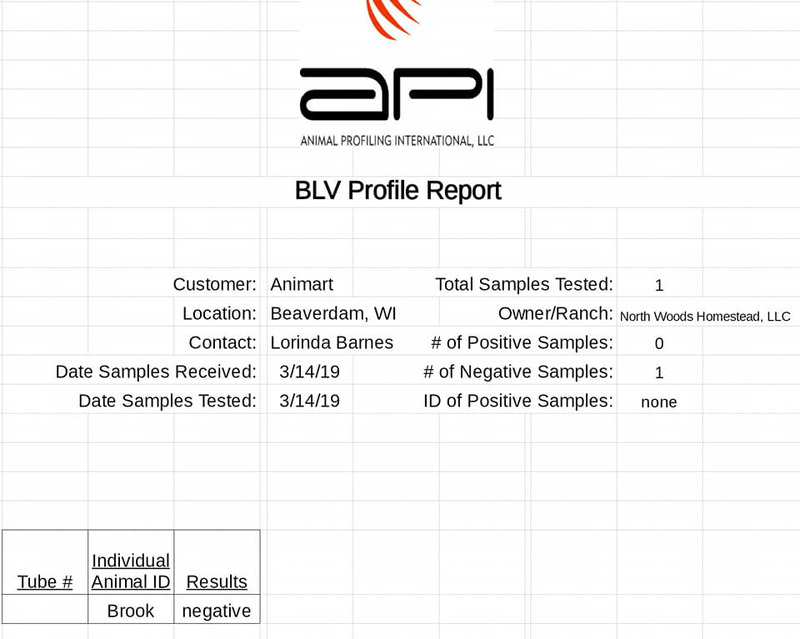 Most of the concerns are highly contagious so testing one cow is a good way to determine if all the cows are infected. This year we tested Betsy. She was a good candidate because she has been with us for a full year and she was in milk. It's easy to collect milk to mail to the lab. 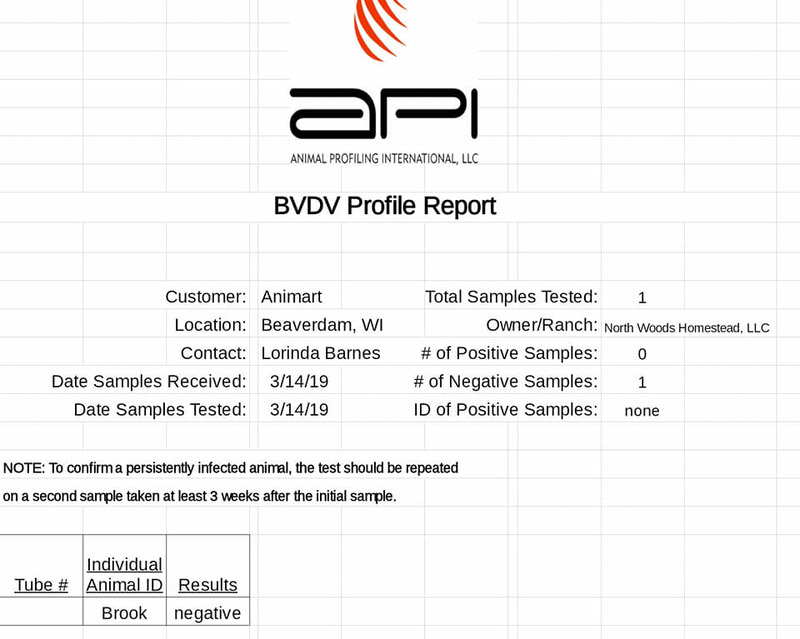 We're happy to announce Betsy, and therefore our herd, is Negative for BVD/Johne's/BLV. We're so happy to know our cows have the best chance at a long, productive life. Any new animals joining our herd are screened by a vet, tested, and quarantined for a month of observation. As we learn more, we implement additional protocols to protect our herd from these deadly infections. "I don't even know where to begin... North Woods Homestead has been such a blessing to my family and I! 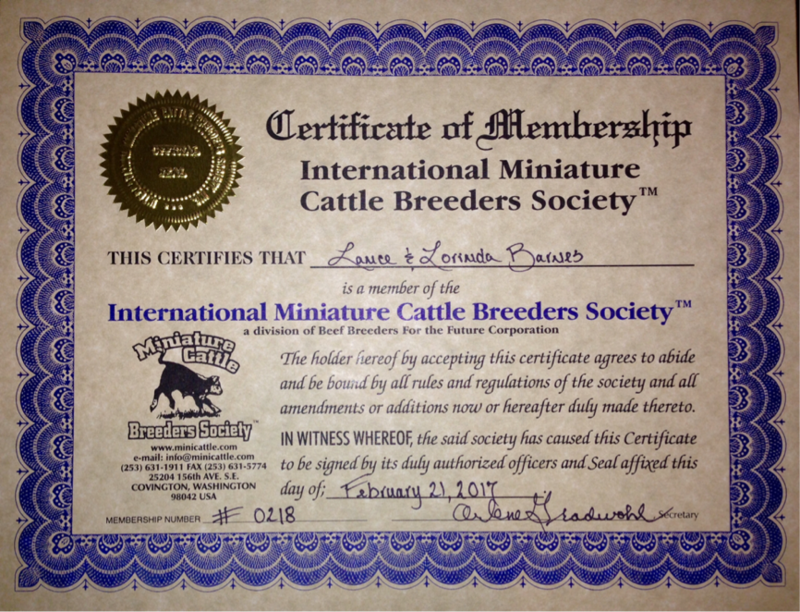 We purchased our first family cow from them and I will forever be grateful for this! I had questions and concerns and Lorinda was there every single step of the way! She was patient and kind with me and I could just feel her passion towards her cows. She's very professional yet I feel like she's my friend, she's honest and I trust her. ​She is helping my homestead dream come true! Thank you!!!! You all will always hold a place in my heart!" "We bought our first Jersey Cow from Lorinda and Lance. They were great, and easy to work with. It was our first family dairy cows so I had a lot of questions. Lorinda answered every single onE of them and made arrangements for her to be delivered to us. This alone was a great help. She had her calf the beginning of August and has been really easy and a joy to milk. 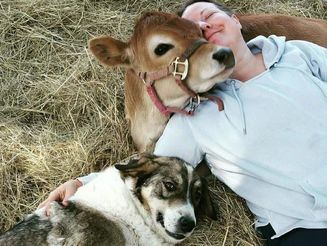 I can tell how much time, attention, and love that Lorinda puts into her animals." "Lorinda is full of curiosity and work ethic and shares what she learns as she goes. It is enjoyable to follow their journey vicariously and you can learn something new as you travel along. Good job, Lorinda and Lance - keep it up!" "North Woods Homestead Jerseys are raised with the utmost care and consideration for the cow's health. They have been loved upon so they are ready to become your family milk cow." Copyright 2010-2019 North Woods Homestead, LLC, all rights reserved. ​All text and images are sole property of North Woods Homestead, LLC, and cannot be used without written permission.